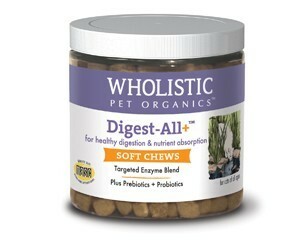 Wholistic Digest-All Plus™ Soft Chews are the same enzyme formula as Wholistic Digest-All Plus™, but now in a convenient soft chew! In addition to actively digesting all the ingredients in your pet’s daily food, Wholistic Digest-All Plus™ Soft Chews contain a very concentrated and potent blend of probiotics known as “friendly bacteria” that supports a healthy balance of normal gut flora. 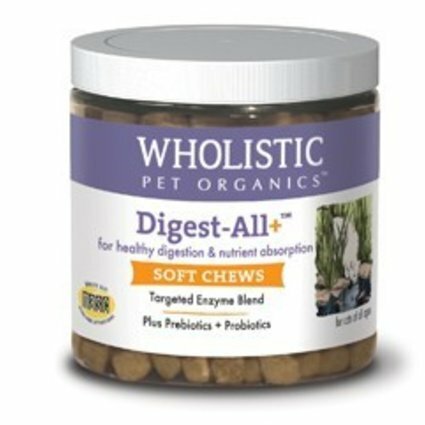 Wholistic Digest-All Plus™ Soft Chews are a pure blend of active non-genetically engineered enzymes with concentrated probiotics that will help your pet unlock the valuable nutrients in food and have an optimally functioning, very healthy digestive system. Enzymes are inherent to all life processes and are integral to the proper functioning of all body systems. Your pet could actually be missing out on the nutrients from the food he eats! Without important enzymes that would normally be replenished by eating wild prey, your pet may be unable to properly digest food. By re-introducing enzymes and "friendly" bacteria (probiotics) into the diet, your pet can unlock the valuable nutrients in food and have an optimally functioning, very healthy digestive system. When foods are not digested properly, the nutrients that your pet would ordinarily obtain from food may not be available. Eventually the immune system can ultimately be affected. Not surprisingly, glands and major organs suffer most from enzyme deficiency.